It would be impossible in less than a full volume of literary biography to give a fair representation of all the good fiction, poetry, and nonfiction presently being written in and about the Ozarks. We give you four authors. We also encourage you to read their works and those of many others listed in Dr. Wesley Hall's selected survey of Ozarks writing in this issue. At Dairy Hollow House, the prize-winning country inn operated by Crescent Dragonwagon and her husband Ned Shank in Eureka Springs, Arkansas, the cuisine is "Nouveau'Zarks." The name--and the food--is like Crescent herself. She is one of the new Ozarks people, doing new Ozarks things. She first came here in youth, in the sixties, to find a refuge in rural America from something that needed fleeing. She has made the Ozarks home, home with almost religious energy and zeal. Crescent is one of the new people, a participant in remaking and reshaping the Ozarks. When I first heard the name Crescent Dragonwagon in the early 1970's I thought it the prettiest, most intriguing, cleverest flowerchild name ever. I didn't imagine that a person so renamed could live up to it. But Crescent does, emphatically, irrepressibly, exuberantly. At age sixteen she and her then-husband took new names---legally--as a sort of counterculture lark. Later, her publishers insisted she retain it as part of an emerging literary persona. "I'd change it if I could," she says, "but I can't." Born Ellen Zolotow, 1952, in Hastings-on-Hudson, New York, she is now, authentically, Crescent Dragonwagon to her various publics. When I think of Crescent and her writings, I think first of food, and of food in season. Her Dairy Hollow House Cookbook is one of the most appreciated volumes in the Flanders's large library of cook books. As I write, I anticipate autumn and winter with more grace because of the mouth-watering soups and other cold season victuals served at the inn. We'll be making them, to drive away the gloom. at Home With the Paper"
Guild of Artists' and Craftspersons' Board Meeting"
"Spring Dinner for New Lovers"
"A Midsummer Night Buffet Feast at Which an Important Announcement Is to Be Made"
Lest one think that Crescent Dragonwagon is essentially a chef who has a clever way with words, I hasten to say that I begin with this genre of her work in order to emphasize her remarkable versatility both as an author and as a creative person. Few poets, novelists, and children's book authors, all of which she is, could manage to create personal cookbooks of such high culinary and literary quality. To become acquainted with Crescent Dragonwagon through her writing, start with The Dairy Hollow House Cookbook (1986), and The Dairy Hollow House Soup and Bread Cookbook (1992). Crescent is now at work on a third cookbook, repons husband Ned Shank in their promotional newsletter, "'Lamp and Book Beside the Bed:' Vol 2. Books by Crescent Dragonwagon, and others, from Dairy Hollow House:"
"Taste the ratatouille," I said to Crescent. "It's wonderful, but what gives it that slight..." I paused. though it's more relishy; caponata, not ratatouille." "Garlic? Some herb?" "No....It's the olive oil! Maybe Spanish?" And so on, in Ned's story "Life with a Cookbook in Process." About herbs and botannicals, too. If you wore it in your shoe. To see me dance and dance and dance. They'll catch you like a dime in the sidewalk. Your hands are warm for the rest of the winter. Crescent's children's books are collaborations with illustrators, as is the case with much of that literary genre. Her latest, Homeplace, is an artpiece by any standard. Jerry Pinckney's lush watercolors, bled to page edges, are strikingly beautiful, and match the evocative, haunting romance of the poetic text. Homeplace is an Ozarks story, familiar to all who have walked through the woods in spring and found a patch of daffodils blooming in the otherwise-wild. We know a house was there, though little else remains. 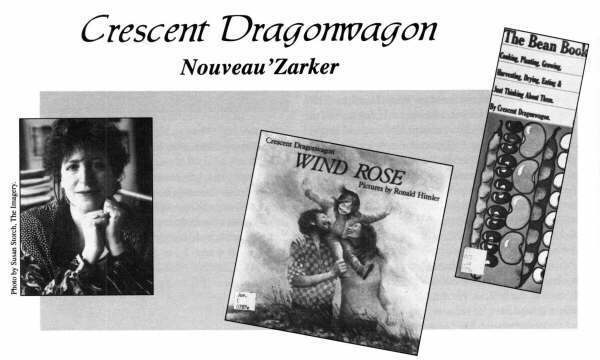 In the literary world Crescent Dragonwagon's reputation developed early as an author of children's books. Unable to bear children of her own, she cannot create stories from experience, the way Dennis the Menace, or the Peanuts kids, were done. She has many friends with children, a kind of"family" of special significance. But, she says "I write mostly out of remembering my own childhood, overlaid with emotions I may be feeling now, as an adult. Emotions, after all, have no age. The causes may change, but 'sad' feels like 'sad' whether you are six or sixty-five." David Lee Harrison, a Springfield native and local businessman, has recently been awarded the Friend of Education Award which is presented yearly by Southwest Missouri's branch of the Missouri State Teachers' Association. 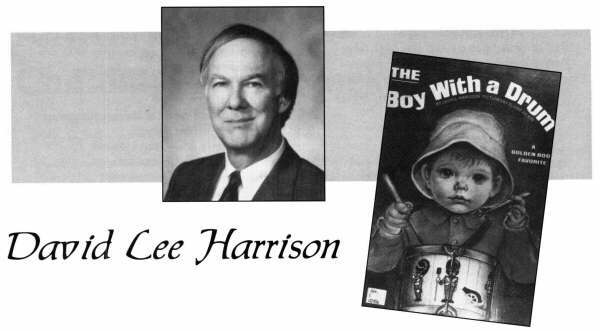 The award is merely one sign of the many contributions which Harrison has made to education and especially to children and children's literature throughout his life. With an A.B. in Zoology and an M.S. in parasitology, Harrison has spent his life pursuing a variety of endeavors, but most of his pursuits have brought him back to his calling as an author of children's books. Harrison is well known by public school teachers and children in the Springfield area. He is often involved in the annual Children's Literature Festival of the Ozarks which is designed to bring area school children together with children's book artists and writers. He is perhaps even better known for his work with the Springfield School District in helping to assemble a collection of writings entitled What I've Learned So Far...(1993). The sale of this collection of practical ("Never go roller skating with a dress on") and philosophical ("Laughter is not always the best medicine, but it's a lot better than aspirin") advice collected from the entire Springfield School District helps to support the writing programs in local schools (5). Some of Harrison's earliest books show his strong interest in science and the physical world. The World of American Caves (Reilly and Lee, 1970) and What Do You Know! (Rand McNally, 1981) are wonderfully readable books full of facts and fascinating information. It is clear from the opening remarks in The World of American Caves that story plays an important role in Harrison's view of how children learn. An amateur spelunker, Harrison has learned the history of the caves he writes about, as well as legends which surround them. He begins with one of the legends about the discovery of Carlsbad Caverns and continues to weave stories and facts together throughout the book. Scientific discussions of cave formations blend well with stories of discoveries and outlaw hideouts. Harrison has also written a number of picture books for young readers. Some of his earliest picture books are designed for the young child who is experimenting with the real world. The Boy With a Drum, illustrated by Eloise Wilkin (Merrigold, 1969), Let's Go Trucks! illustrated by Bill Dugan (Golden 1978), and The Snoring Monster illustrated by Richard Walz (Golden, 1985) confront the realities of the physical world--the creatures both real and imaginary, flesh and metal, which inhabit the world of the child. Using his drum as an animal magnet, The Boy With the Drum is able to create a parade of friendly domestic creatures. In The Snoring Monster a young boy goes to his father for aid in fighting a variety of night fears. Harrison may be best known, however, for his books of fantasy. Although one of his earliest imaginative books, Little Turtle's Big Adventure (illustrated by J.P. Miller, Random House, 1969) is primarily concerned with the life of a turtle and its struggle for survival in real life situations, fantasy and folk characters such as giants and witches inhabit many of his other books. These books include The Little Boy and the Giant, illustrated by R. O. Fry (Golden, 1973) and Little Boy Soup, illustrated by Toni Goffe (Ladybird, 1990). 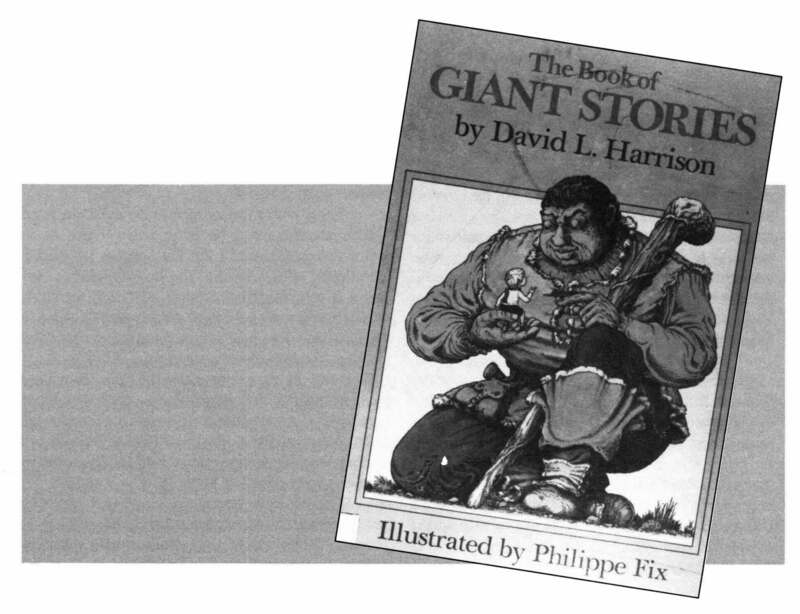 The Book of Giant Stories, illustrated by Philippe Fix (McGraw Hill, 1972) is one of his best known books. A winner of the Christopher award, The Book of Giant Stories and many of his other fantasies use familiar material of giants and witches to emphasize the resourcefulness of children. Children manage to outwit giants and witches and resolve problems which adults cannot. Who captured two frogs in a ditch. These early examples of his imaginative poetry set the stage for his most recent contributions to children's books--poetry. His latest books are all written in verse and include Somebody Catch My Homework, illustrated by Betsy Lewin (Boyd Mills, 1993); When Cows Come Homes, illustrated by Chris L. Demarest (Boyd Mills 1994); and The Boy Who Counted Stars, illustrated by Betsy Lewin (Boyd Mills, 1994). Somebody Catch My Homework showcases Harrison's affinity with the mind of children. Many of the poems capture the harried and confused world of school and daily life. Last night I knew the answers. Last night I had them pat. Every answer, just like that! Last night my brain was cooking. Last night I got them right. Last night I was a genius. The concern children have about school, friends, love, and books fill the pages in verse that is both simple and sympathetic. The book has been nominated for the Kentucky Bluegrass Award, was named book of the year by Bank Street College, and was a winner of the Children's Choice Award. Harrison followed his first book of poetry with two more each with its own distinctive features. When the Cows Come Home is a book-length ix)em concerned with the hi-jinx of some out-of-control cattle who stop short of opening their gate and escaping into the unknown world outside of their pastures. The Boy Who Counted Stars is an interesting foray into the imagination of childhood. After speaking to Mr. Harrison, I realized that his commitment to children and to education is probably as great as that of anyone I have ever known. Harrison proudly informed me that What I've Learned So Far... was presented, in a cooperative effort between SMSU, the YES Troop, and the Springfield Little Theater, at the Juanita K. Hammons Hall for the Performing Arts on February 2, 1995. There is no billboard on Highway 65 south of Springfield, Missouri that proclaims the talents of Janet Dailey; but of all the artists and famous people who call Branson and vicinity home, none is more talented or successful than this nationally known writer. In the genre known as the "romance novel" she has been sensationally successful. In recent years she has turned, with equal success, to "historical romance,'' a genre that immediately brings to mind writers like James A. Michener and Herman Wonk. While Janet Dailey is not, strictly speaking, a regional writer, any survey of "Writers of the Ozarks" today would be seriously incomplete without her. Her inclusion in this issue of OzarksWatch is justified for two very important reasons: She has made Branson her permanent home, and two of her most powerful novels have been set in the Ozarks: Foxfire Light and Show Me. A very successful movie based upon the former was shot on location in the Branson area. Although Dailey's roots go back to rural Iowa, she has moved about all over the country with her husband, Bill, doing research for her many books. Recently, at a high point in her career, she decided to settle in one spot and call it home; her searching for a building site ended on the left bank of Lake Taneycomo on Lake Shore Drive. When asked how she feels about living in the Ozarks, she did not hesitate: "I think it's an ideal place to live. The weather is generally good, the country is beautiful, and the people are so friendly--and unobtrusive.'' She seemed genuinely surprised that in Branson the celebrity is treated just like everybody else. "Everyone is equal down here," she said, smiling. Interviewing Janet Dailey was like chatting with an old friend. She has heard all of the questions; but each of her responses was, for me, fresh and practical. I began by asking if she had any advice for the aspiring writer in the Ozarks. "The best and the worst advice I ever got was to write about things I knew!" she said. "I realized the wisdom of this advice, but when you are a very young person growing up in rural Iowa, where does it leave you? In time, of course, I realized that I could write about anything I wanted to." After a moment she added, "After researching it." Then, with a distant look in her eyes, she began talking about her own beginnings as a writer. At one point she exclaimed, "I did not want to write about cornfields!" She went on, "You could write about anything, if you researched it enough. The thing was--the first rule was---that you simply had to write. A teacher can tell you what is good and bad about your writing, but after that it is up to you." Networking is important, she feels. Beginners who are having difficulty finding a publisher should join writers' groups and perhaps go to writers' workshops occasionally. Sometimes it's possible to get the ear of a working writer (publishing) and thus open the door for one's own first book. The aspiring writer, she continued, generally serves some kind of apprenticeship early in his or her career. "Mine was writing Harlequin Romances. I wrote seventy of those before I published my first main-stream fiction". Many new writers experiment with short fiction, perhaps after some freelancing for magazines. "It's important to stick with what you do best." She admitted that there were some kinds of writing she had no intention of attempting. Factual things, she said, were impossible for her unless she embellished. She had to put some of herself into whatever she wrote. "I would never do well as a journalist," she conceded. For Dailey there has always been what she calls a "well" from which she gets her ideas, characters, and plots. It seems bottomless, at this point. Faulkner had his "woodshop" from which he fashioned his great Yoknapatawpha Saga, and E Scott Fitzgerald spoke (and wrote) directly about the writer's eventual "emotional bankruptcy"-the point at which he has exhausted his storehouse of ideas. Janet Dailey, according to a source close to her, has written a book about every state in the Union. Recently published in hardback, The Proud and the Free focuses upon the "Trail of Tears" tragedy. She said that she must have read fifty or sixty books on the subject; then, to gather atmosphere, something that is lacking in book research, she and her husband traveled to Georgia, picked up one of the original trails the Cherokees took, and followed it westward. This book will be out in paperback next June, according to Barnes and Noble in Springfield, Missouri. Yes, Dailey is working on a new novel; but she's not ready to disclose to an interviewer what it is. She said, "I like best the research, but I also enjoy my time alone when I write. Until I finish nobody sees what I'm doing." Mike Bums is a poet of borders and spaces, between Ozarks hills and Mississippi River delta, between blue mists and shimmering waves of lowland distances, between remembered and forgotten past and the present, between the commonplace world of cotton bolls, sore fingers, dirt, false teeth, icy road, living alone and old and the spiritual world of gods and heaven and dream. His subject is always the division between the common and the spiritual and our human need to unite them. Mike was born and reared near where the pine and oak of the Ozarks give way to the cotton and soybean of northeast Arkansas. He was not born to an easy life, but he was born to dream, like all of us. He remembers his early days, with their childish innocence and dream hunger. In "Star Bright," a new poem, he reminds us of ours. lie down in the half-filled wagon. We were children. We still had faith in The Wish. We burrowed into the cotton, beneath the chill, and watched from there the sky for the first star. From those early dreams in Egypt, Arkansas, just across the Black River bridge from the edge of the Ozarks, Mike has moved through three college degrees to teaching at Southwest Missouri State University, a family, living in a rebuilt farmhouse in a pasture outside Willard, Missouri. Twenty-two years and five books after coming to the Ozarks, Mike is still here. The Ozarks--its land and its people--are very much a part of his poetry. The first of his books, now out of print, collected the work of other regional writers. With Mark Sanders, Mike edited the anthology Jumping Pond: Poems and Stories from the Ozarks. Another edited book gathers important critical essays about one of the best-known poets living in the Ozarks---Miller Williams and the Poetry of the Particular (University of Missouri Press, 1991). 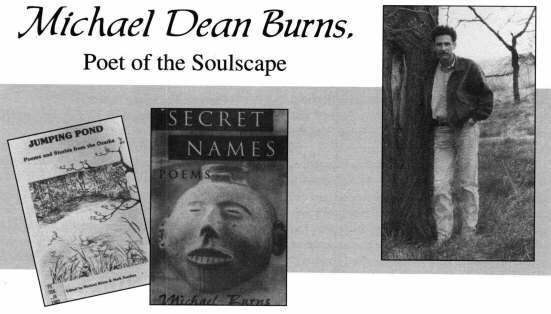 Bums' own poetry has been published in numerous regional and national magazines and in three books: When All Else Failed (Timberline Press, 1984), And As For Darkness (Greentower Press, 1987), and The Secret Names (University of Missouri Press, 1994). The steady growth of his craftsmanship and art first won for him the 1992 Missouri Biennial Writer's Award from the Missouri Arts Council and then major recognition in a 1995 Fellowship from the National Endowment for the Arts. After twenty-two years of technical practice, Mike clearly demonstrates in The Secret Names that a modem poet can pour new and heady wine into old bottles. In an age when few readers ever buy a volume of poetry because they believe modem poetry has lost its music and its relevance, Mike has so mastered the common voices in settings such as river, pond, cotton field, classroom, death watch, and pulpit that only readers with practiced eyes will notice the sonnet, villanelle, and other traditional poetic forms. What is really noticeable about Mike's poetry is that it teaches us how to confront ourselves in an age of great doubt--doubt about ourselves, about family, about the human race, about spirit. How does one who cannot or will not believe answer one who still believes in The Wish? circling our old dog's grave. you were talking to was God. For you, I'm trying to hear. in what He has to say. And how does an old doubter try to bear--and thereby confront oneself? In "Farm Road 93' the speaker drives down a road so slippery it's easy to turn where there are no turns. It's Sunday morning. The speaker is not going to church--not this old doubter. Yet "the bone and blood, the longing, the mild regret" compel the speaker on, on down "this white [line] on black [pavement]" (another dividing line) and, through a punning reversal, this black print on white paper, to a confrontation. The speaker says, and I might be able to get to the lake and watch the ducks, go out myself on the ice. I want to walk along the bridge and make believe I'm talking to God. I need advice on everything, not just this white on black, and I'm almost there. I'm taking the long way back. Having come up out of Egypt, Michael Bums may not be able to solve the big riddles for his readers, or even for himself. But in a beautiful if common language, his poetry calls each of us to reexamine our own predicaments. Therein, perhaps his poetry suggests, lies delivery from dilemma.